Welcome to the fifth blog in the series of posts on learning objectives. In my previous posts, we have looked at the importance of learning objectives. We have also seen the six levels of the cognitive domain of Bloom’s Taxonomy, viz. Remembering, Understanding, Applying, Analyzing, Evaluating, and Creating, which is concerned with mental skills (knowledge). Today, we will examine the Affective domain which deals with behaviors and emotional areas (attitudes). 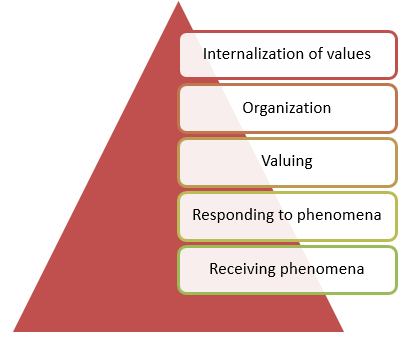 The Affective domain categorizes learner behaviors into five levels. Let us look at each level in detail. At this level, learners comply with the phenomenon after getting answers to their questions on the need for the phenomenon. Examples of behavior at this stage are complying with the norms specified by the company and discussing the importance of the new social media guidelines. The verbs used to indicate behaviors at this stage are as follows. Learners attempt to incorporate the phenomenon into their work lives. Examples of behavior at this level are creating a plan to ensure work life balance and accepting the new code of conduct. The verbs used to indicate behaviors at this stage are as follows. Let us now look at how learning objectives can be framed for change management training, held as part of an ERP implementation, for each level of the Affective domain. Receiving phenomenon The staff of a company is willing to listen why its existing system is being replaced by the ERP software. Responding to phenomenon The staff complies with the decision of the management after the latter answers questions about the necessity of implementing the ERP software. Valuing The staff demonstrates its belief that the ERP software would improve organizational efficiencies and is motivated to attend the training program. Organization The staff members discuss what can be done to integrate the ERP software into their work effectively. Internalization of values The staffers perform their job tasks using the ERP system. The Affective domain of Bloom’s Taxonomy deals with the behaviors and emotional areas (attitudes) of learners. It categorizes learner behaviors into five major categories. In my next post, we will examine the Psychomotor domain of Bloom’s Taxonomy. So, stay tuned.